3 3/4-inch tall Bandaged Patient action figure! The Bandaged Patient is even more disfigured in color! Limited edition and individually numbered! In a world where everyone looks the same, poor Janet Tyler just doesn't conform to the norm. The bandages are about to come off, did the procedure work? You'll find out in Episode 6 "Eye of the Beholder" from Season 2 of The Twilight Zone written by Rod Serling. From Bif Bang Pow!, this detailed color figure of the Bandaged Patient measures 3 3/4-inches tall and is crafted from plastic. She features five points of articulation, as well as the retro design of action figures from the 70s. 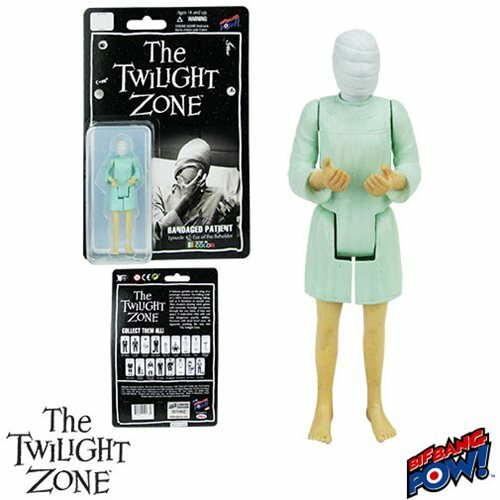 The Bandaged Patient action figure is individually carded and is a Limited Edition of only 462 pieces. Order yours today! Ages 14 and up.